I don't plan on posting recipes from The Asian Vegan Kitchen because I think everyone should buy it immediately. 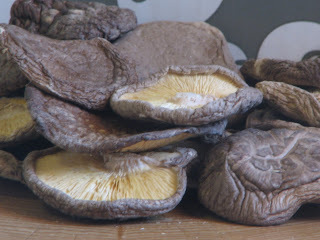 But I will make an exception for the Shiitake Mushroom Dashi because it's simple, traditional and probably not a recipe thats impossible to find out there. So I'm putting it on my blog. The reason is this: it's wonderful. So warm and comforting yet light and barely there. If that makes any sense. It's the perfect base for miso soup (or any light soup) when mixed with konbu dashi or on it's own. 1. Wash the shiitake briefly. 2. Soak the shiitake in 3 cups of water. Place a small lid or plate over the mushrooms to prevent them from floating. Leave for 4 - 5 hours then remove the shiitake and use water for stock. (If short on time, pour 3 cups of boiling water over the mushrooms and let them stand covered for 10 minutes.) The broth should have an amber color and the fragrance should be mushroomy.